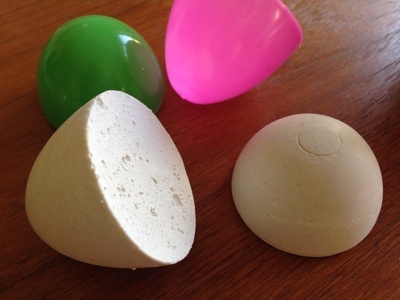 Create some eggs from plaster of Paris and have fun decorating them. They are tricky to make but are worth the effort. 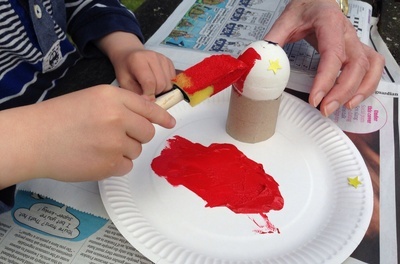 The plaster eggs are substantial and hard to break so are ideal for toddlers or preschoolers to decorate. They can also be kept forever, unlike hard boiled eggs. 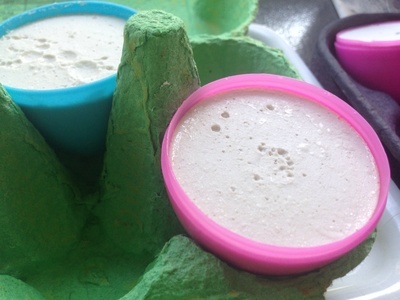 Try using them for a chocolate-free egg hunt at Easter. 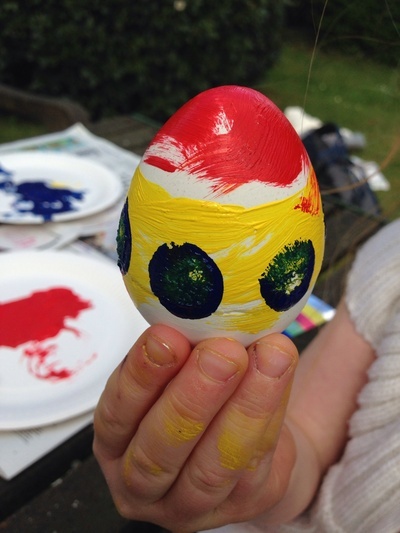 Rub the insides of the plastic fillable craft eggs with a little oil or Vaseline. (This will help release the plaster egg later). Lay the egg halves out in an empty egg box. Make up the plaster of Paris according to the pack instructions then add a little extra water. (This makes it easier to remove from the moulds later). The consistency should be like pancake batter. Make the plaster mix up in a disposable tub so that you can throw it away afterwards rather than pouring left over plaster down the sink. 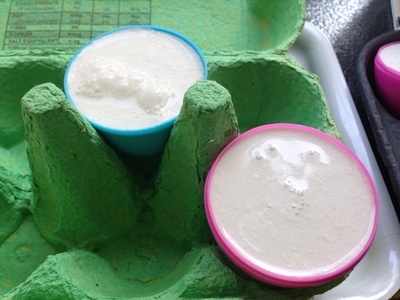 Fill the plastic craft eggs moulds up to the top with the plaster of Paris mix. Leave to set. Quite a bit of water should settle out to the top. 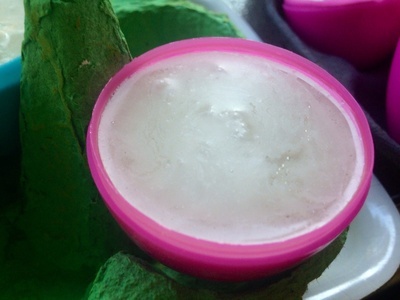 You can soak this up with a paper towel to speed up the drying process. Leave for a few more hours then pop the plaster egg halves out of the moulds. 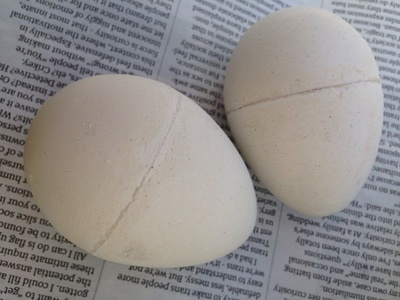 Leave the plaster egg halves to dry out for a further 24 hours. 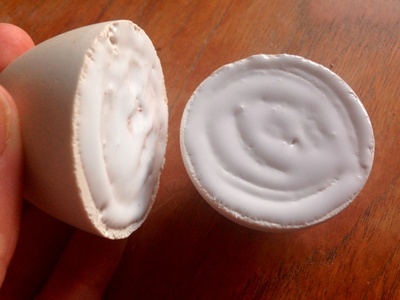 Glue the egg halves together with strong PVA glue. Once dry, use the sandpaper to smooth the join. Have fun decorating. 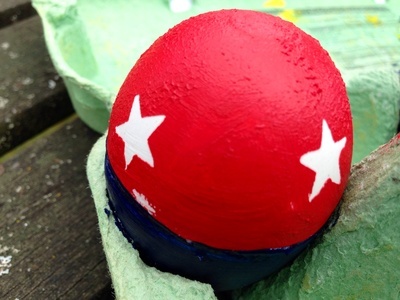 We used acrylic paints and a toilet roll tub cut in half to make a stand for the painted egg to dry on. With toddlers or preschoolers, try adding sticky stars or sticky dots before painting. They can then paint over the stickers. When the paint is dry, peel off the star stickers to get an interesting design. 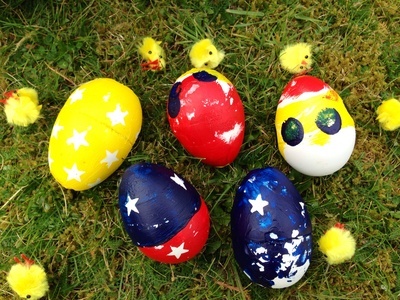 If you've got left over plaster, try making some Easter decorations to hang on a branch.